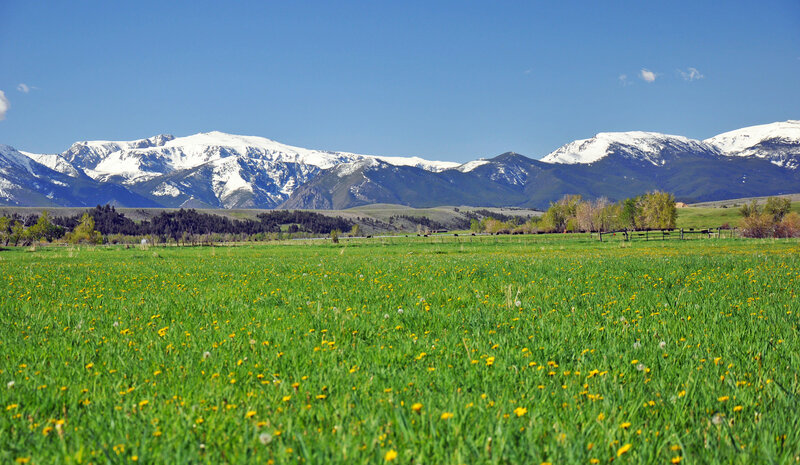 Fishtail Meadows Ranch, situated in one of the most beautiful areas of Southcentral Montana, is tucked between the Stillwater River Valley to the north, the Rosebud Creek drainage to the east and the towering peaks of the Beartooth Mountains to the west. With frontage along Fishtail Creek and in close proximity to the resort town of Red Lodge, the Ranch affords a rare opportunity to own productive ground in an area accentuated by natural beauty and outstanding recreational opportunities. The Ranch spans over 678± acres including 320± deeded acres of native pasture, 258± deeded acres of irrigated land and 100± acres riparian/wetlands along Fishtail Creek. 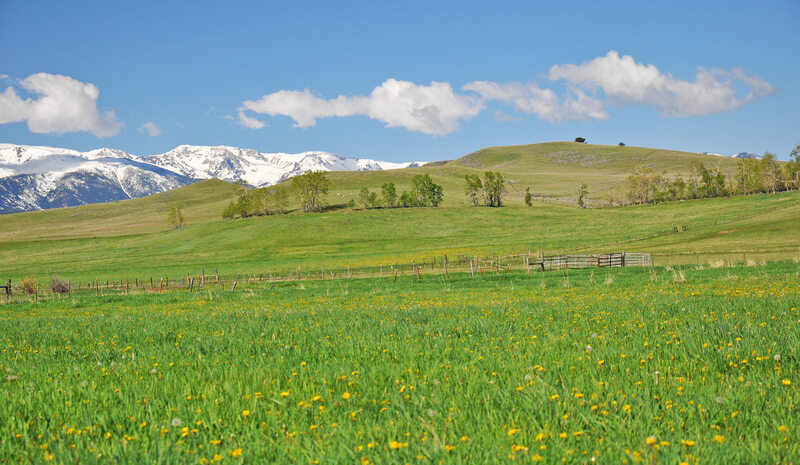 The topography of the Ranch is diverse and inviting, transitioning from the riparian land in the cottonwood groves along Fishtail Creek, to the lush irrigated hay meadows, to the native rangeland punctuated with views of the majestic Beartooth Mountains to the south and Crazy Mountains to the north. The combination of live water and irrigated hay fields adds to the production value of the Ranch and also provides for exceptional wildlife habitat. A variety of game birds frequent the Ranch while resident herds of mule deer and whitetail deer find cover in the ravines and along the creek bottom. A modest set of improvements are well maintained and conveniently located on the east portion of the Ranch. Within an easy hour drive of Billings, the proximity of the Ranch to commercial airports, private FBOs and interstate travel make it readily accessible at all times of the year. 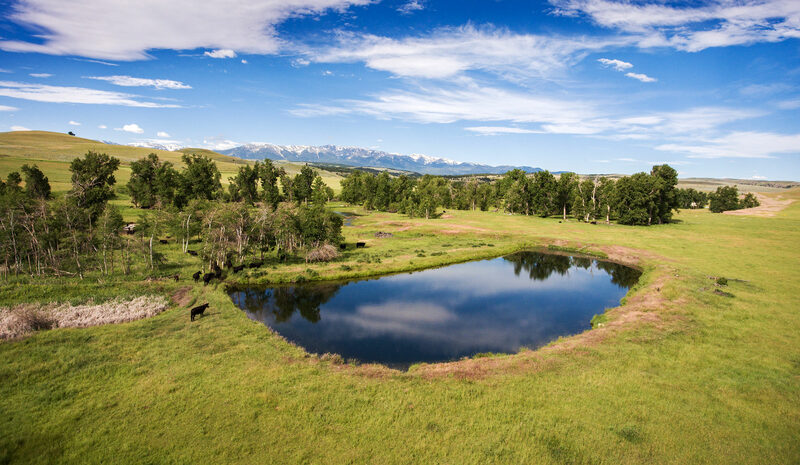 With its exceptional combination of live water, productive ground, resident wildlife, stunning views and proximity to the recreational opportunities of the nearby Absaroka and Beartooth Mountains, Fishtail Meadows Ranch offers a unique opportunity to experience ownership of a productive ranch in a spectacular setting. To access the Ranch from I-90, take the Columbus exit and head 14 miles southwest on MT-78 to Absarokee; continue South 2.86 miles to the junction with the Nye Road MT-419. Proceed 3.4 miles southwest to Fishtail. The Ranch Headquarters is 1 mile southwest of Fishtail off MT-419. Columbus and Absarokee – both classic rural Montana towns, provide important services to the area. Each community offers banking, grocery stores, various churches, mechanics and repair shops, and ranch supply stores. A complete complement of services, healthcare, restaurants, shopping and entertainment can be found in Montana’s largest city of Billings, just over an hour’s drive from the Ranch. Located on the West Rosebud River, the “home town” of Fishtail has retained its rural roots and provides residents with a coffee house, the Cowboy Bar and the Fishtail General Store - offering supplies including food and drink, clothing, hardware, camping, hunting & fishing supplies and licenses. Absarokee public schools offer kindergarten through high school educational opportunities. While Fishtail Elementary School, one mile from the Ranch, offers pre-school through sixth grade. Small class sizes and ample individual attention make these rural schools some of the most protected and finest educational opportunities available today. Some of Montana’s best colleges and universities are within a two-hour drive of the Ranch including Montana State University in Bozeman and Montana State University Billings. The proximity of these campuses provides diverse cultural and educational opportunities for the people of Southwestern Montana. A comfortable hour’s drive from the Ranch, Billings Logan International Airport offers several full-service FBOs and excellent commercial services through Alaska Airlines, Allegiant, Delta, Cape Air and United Airlines. Distances to other Montana cities and points of interest from Fishtail Meadows Ranch are listed below. Fishtail Meadows Ranch ranges in elevation from approximately 4,474' above sea level along Fishtail Creek to approximately 4,857' above sea level at the highest reaches of the Ranch in the native pasture to the west. The improvements sit at an elevation of 4,513’ above sea level. The average annual precipitation is 24.76 inches, with the majority of the rainfall occurring in May and June and average annual snowfall of 176 inches. Average high temperatures in June, July and August range from 67° to 75° Fahrenheit. Summer average minimum temperatures range from 44° to 51°. In December, January and February average high temperatures are between 34° and 37°. Winter average minimum temperatures are typically between 18° and 19°. There is plenty of sunshine. The climate allows between 90 and 100 growing days annually. The topography of the Ranch is varied and encompasses many attributes appreciated in a productive Ranch. Fishtail Creek meanders for approximately one-half mile as a meadow stream through the lush creek bottom along on the north portion of the property. With cottonwood and aspen groves, the riparian area is further enhanced by a one-acre spring-fed trout pond. The Ranch transitions from the creek bottom into lush irrigated hay fields and grazing pasture by the Ranch Headquarters. The balance of the Ranch gains elevation and opens up to native pasture on the hillsides, ravines and meadows on the west portion of the property. The views of the nearby Beartooth Mountains are breathtaking. The Ranch has been utilized for the past several years to run a herd of about 75 cow/calf pairs grazed in the summer months under a lease with a local cattleman. Prior to the lease agreement, the owner ran a herd of 145 cow/calf pairs year round utilizing more intensive grazing practices and rotation. Grass utilization is carefully monitored and cattle are rotated based on use. It is apparent that the current owners have managed the grazing resource of the Ranch conservatively. 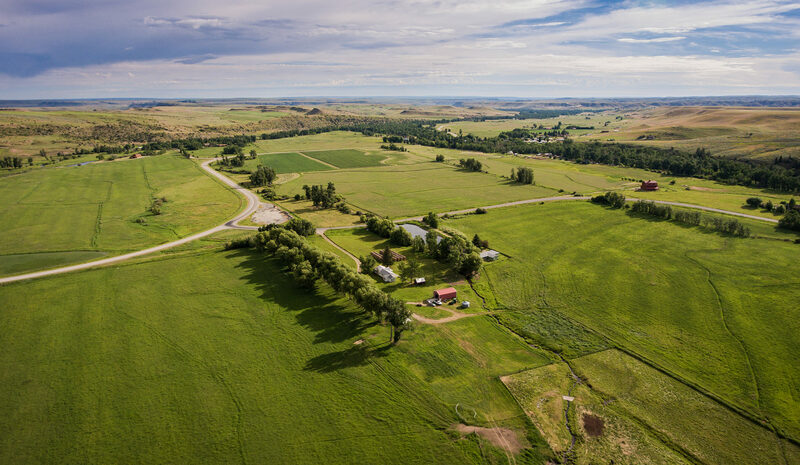 The Ranch has good irrigation water rights from West Rosebud Creek and multiple stock water options including a 25-gallon per minute well for stock water on the upper pasture. Controlled releases from the Mystic Lake Dam into the West Rosebud drainage translates into plentiful supplies of irrigation water available even into late season. 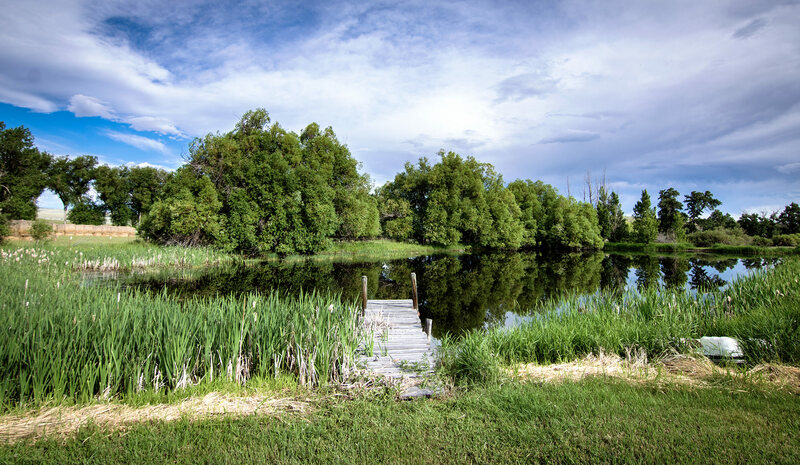 Additional water resources on the Ranch include a small spring south of the headquarters providing additional stock water and a .75-acre pond near the main residence. The hay yields from the 100±acres of irrigated ground produced about 2.5 tons per acre. Two cuttings of alfalfa hay are routinely generated on some of the hay ground and more ground could be placed into production with some additional farming. The hay ground is currently watered via flood irrigation. Multiple live-water sources on the Ranch provide excellent water resources for livestock and wildlife. Fishtail Meadows Ranch has been in the same family for over 100 years and the Ranch Headquarters remains tucked near the original homestead location behind a mature shelterbelt on the east portion of the property. The Headquarters is very clean and well maintained with a modest set of improvements. The next owners will not be paying for overbuilt or unneeded improvements. The main residence, built in 1970, is a 2,500± square foot rancher with a double-car garage. The four-bedroom home has a living room, kitchen, pantry-utility room, two full baths, and a covered-porch entry. It operates on a separate domestic well and septic system. The home is heated primarily with electric radiant ceiling and baseboard heat and a high-efficiency wood stove offers supplemental heating. A large, newly-constructed deck adjoins the main residence and four-foot soffits provide for plenty of sun in the winter and ample shade in the summer. The home offers a comfortable retreat from which to enjoy all the property has to offer. The historic 2,000± square foot guest home, dating back to the early 1900s, is currently used as a rental guest house. The Hammond Guest House has a living room with a wood-burning fireplace, kitchen, pantry-utility room, two full baths, three bedrooms and a covered-porch entry. It operates on a separate domestic well and septic system and is heated primarily with electric baseboard heat. As with many older homes, multiple additions have been added to the structure over the years. This 25' x 40' steel structure provides equipment storage and shop area. This structure, with power and a concrete floor, appears to be in excellent condition. Located near the guest house, this 20' x 10' wood structure offers a hint of the old homestead and is currently utilized as a firewood storage building. The 1300 bushel grain bin is located near the machine shop and appears to be in good condition. Fence lines are in good condition and appear to require little immediate maintenance. The Sellers hereby make known that there may be variations between the deeded property lines and the location of the existing fence boundary lines on Fishtail Meadows Ranch. The Sellers make no warranties with regard to the location of the fence lines in relationship to the deeded property lines, nor do the Sellers make any warranties or representations with regard to specific acreage within the fenced property lines. The Sellers are selling Fishtail Meadows Ranch in its “as is-where is” condition which includes the location of the fences as they now exist. Boundaries shown on any accompanying maps are approximate. The maps are not to scale and are for visual aid only. The accuracy of the maps and information portrayed thereon is not guaranteed nor warranted. The real estate taxes for 2016 were approximately $2,225. The Sellers will convey with the Ranch 100% of whatever mineral, oil, gas, geo-thermal, hydro-carbon and gravel rights they actually own, subject to reservations by previous owners. The Sellers make no representation as to the quantity or quality of any mineral or other sub-surface rights appurtenant to the Ranch. Electricity is provided by Beartooth Rural Electric. Telephone and DSL internet services are provided by Nemont Communications, Inc. Cellular communication is available on the Ranch via ATT or Verizon. Electric costs for the homes and shop were approximately $380 per month in the winter and $250 per month in the summer. Domestic water is provided by wells and the sewer system is septic. 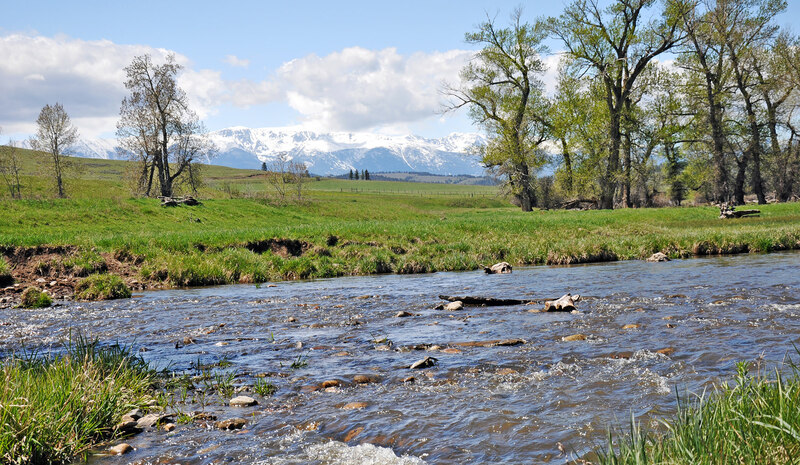 All water rights in Montana are subject to eventual re-adjudication by the Montana Water Court and, as a result of that process, may be changed as to validity, amount, priority date, place of use and other such changes as the Court determines. The Sellers have made all of the filings currently required and will transfer the water rights as they currently stand with no warranty of future viability. 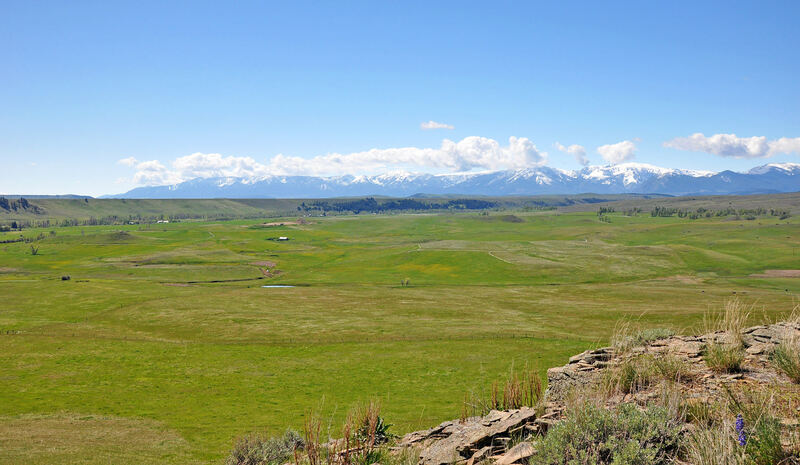 Fishtail Meadows Ranch is under a protective Conservation Easement through Montana Land Reliance. This protection ensures that the land continues to contribute to scenic and open space values in the area. The easement allows for an additional residential development site and an additional lodging structure by the creek. A copy of the full easement is available upon request. 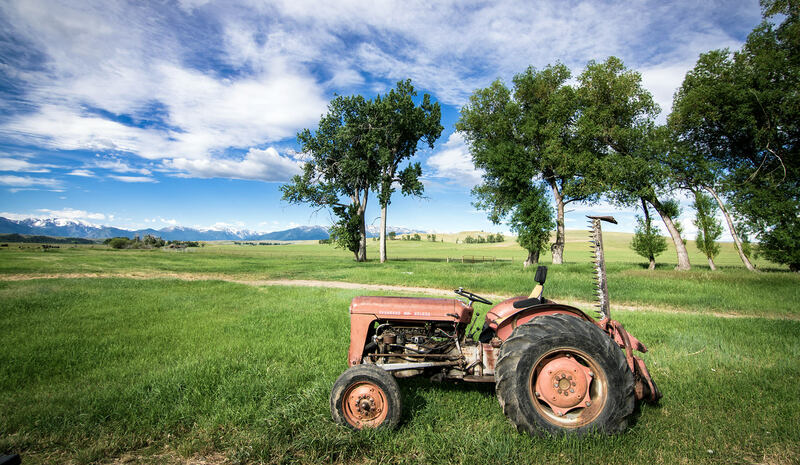 Fishtail Meadows Ranch is at the threshold of some of the finest recreational opportunities that Southcentral Montana has to offer. A lifetime could be spent discovering all the possibilities including flyfishing, hiking, hunting, biking, rafting, horseback riding and sightseeing – all are at the explorer’s fingertips just out the door of the Ranch. The stunning Absaroka-Beartooth Mountains provide the backdrop for the Ranch and are full of hiking or horse-riding trails which spread across the Beartooth Front. The mountains are an integral part of the 20-million-acre Greater Yellowstone Ecosystem that ultimately borders Yellowstone National Park. The Beartooths invite exploration with vast alpine plateaus including the highest peak in the state of Montana - Granite Peak at 12,799 feet above sea level – is visible from Headquarters. The mountains and foothills are home to a healthy population of mule deer and whitetail deer. Elk, black bear, coyotes, eagles, bobcats and mountain lions also call this area home. Upland birds in the area are grouse and partridge. The nearby beautiful and wild Stillwater River, a tributary of the Yellowstone River, flows for approximately 70 miles and is accessed just north of the Ranch. The river contains an abundance of brown, rainbow and cutthroat trout. Numerous access points are provided for floaters with the river offering class 4 and 5 rapids in the upper stretch and class 2 to 3 downstream and a variety of rapids in between depending on the time of the year. Anglers will also appreciate the nearby Yellowstone River for a world-class floating experience. Red Lodge Mountain in nearby Red Lodge offers downhill skiing at its best. Boasting no lift lines and small town attitude, the mountain receives on average 250” of snow during the ski season and has snow making equipment to supplement. Standing atop of Grizzly Peak, one can see Cole Creek, the undisturbed Barriers or the far away Crazy Mountains. With terrain for all ability levels, the ski mountain sits on a base level of 7,433 feet with a summit at 9,416 feet. The lifts can move 10,690 skiers per hour so there is little time spent waiting for a chair. The resort town is also home to fine dining, art galleries and shopping in the various boutiques and shops. Fishtail, Montana - a sleepy western town where wildlife still out numbers people - was named after Fishtail Butte, a local rock outcrop that looks similar to a fish’s tail. Originally settled by homesteaders, the land for the town was bought and sold a few times before settling in the hands of a man with a last name of Mason. From there he platted and register the town known as Fishtail. In the early days of Fishtail’s history, the general mercantile which also functioned as the local post office was erected. There was also a saloon, hotel, livery barn and a blacksmiths shop. Ranching and farming were the area’s main resources. As Fishtail emerged as a town, the local hotel was hopping. It is said that cowboys would gather on the porch of the hotel after visiting the town saloon and race horses at the hotel. When prohibition was enacted 1917, the local saloon closed and soon after the hotel. The bar was turned into a mill which made flour and other grain products for the surrounding farms. The mill was eventually demolished. The first generation of the current Ranch owners, the Hammond Family, homesteaded near Fishtail and were also instrumental in moving the flour mill to town. Eventually the family owned the Fishtail General Store during the 1920s when the Mystic Lake Dam was under construction. Today the General Store still operates and offers customers goods and services and a trip into the past. The nearby town of Red Lodge was originally named for the Crow Indians’ custom of marking their tepee lodges with paintings of red earth. The town originated as a stage stop in 1884 and became a town in the late 1880s when the Northern Pacific Railroad laid tracks to take coal back to Billings. The town remained a bustling mining town until the 1920s brought hard times and the mines began to close. A large explosion at the Smith Mine killed 74 people and soon closed leaving behind only a mining legacy. As Red Lodge continued on its survival mission it adopted the Hollywood idea to be a western town. With the local rodeo building momentum, the town leaders tried to steer the locals to play up the cowboy look and dress in western attire. Although the three-day rodeo attracted many visitors, the actual residents count continued to decline. Locals did not want to play along with the idea of westernizing the West. The Beartooth Highway was completed on June 14, 1936 and Red Lodge emerged as a gateway town to the mountains. It is now a favored stopover for motorcyclists and others heading over the pass to Yellowstone National Park in the summer and a western resort ski town in the winter. 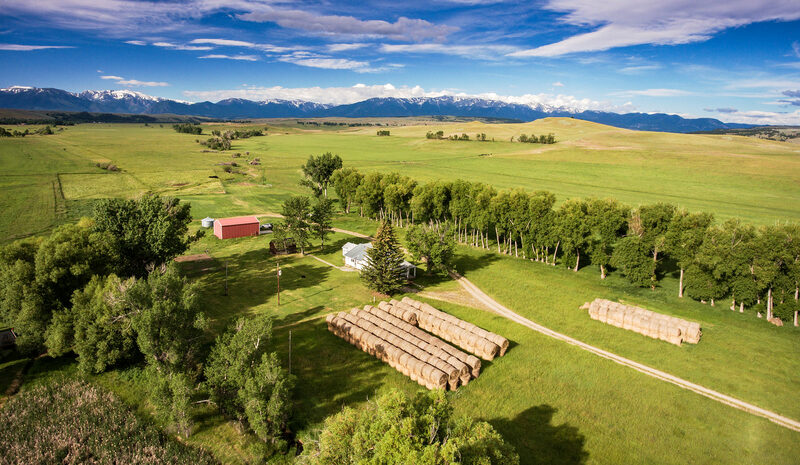 Fishtail Meadows Ranch provides the unique opportunity to acquire a working ranch in the foothills of the beautiful Beartooth Mountains. 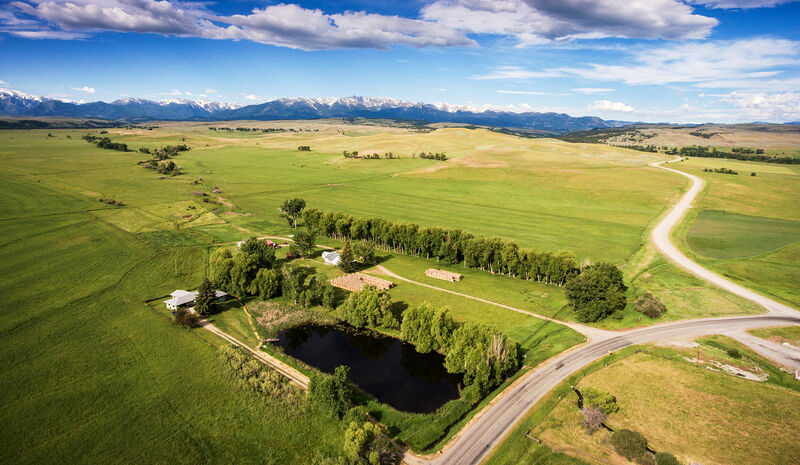 Consisting of 678± acres of deeded land, the well cared for Ranch furnishes all the necessary attributes for a successful working investment, full-time residence or recreational property. Strong water influences including good water rights on the irrigated ground, multiple stock-water options, Fishtail Creek frontage and two spring-fed ponds, enhance the value of the Ranch. The water enriches the productive ground as well as attracts wildlife from the surrounding land. The modest but well-maintained improvements are move-in ready. However, multiple build-site options exist for new construction to suit the next owner’s taste. 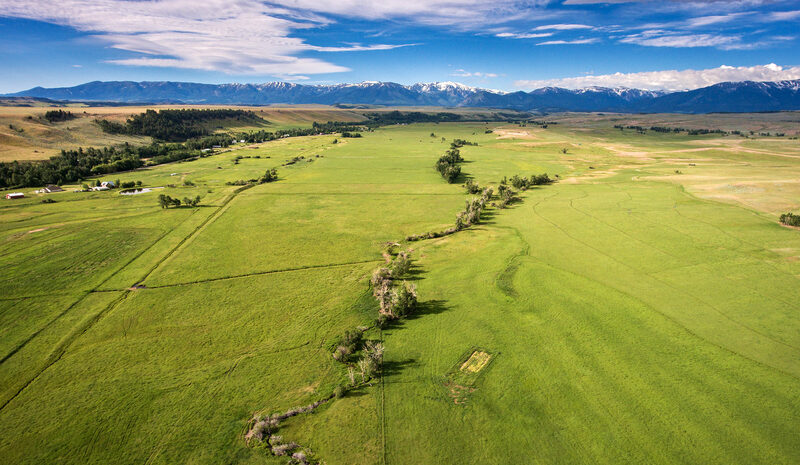 With the desirable combination of live water, irrigated ground, stunning views, reliable access and spectacular location, Fishtail Meadows Ranch will appeal to the next owner as a home base to enjoy all that Southcentral Montana has to offer. Buyers’ Brokers are welcomed and invited to contact Steve Leibinger or Mike Swan in our Bozeman Office for information regarding Cooperation Policies. The Sellers reserve the right to effect a tax-deferred exchange for other real property in accordance with provisions in Section 1031 of the Internal Revenue Code. The Buyer will not be required to incur any additional expenses nor to step into the chain of title on any property which the Sellers may acquire. This entire Offering is subject to errors, omissions, prior sale, change or withdrawal without notice and approval of purchase by the Sellers. Information regarding land classifications, acreages, carrying capacities, crop yields, potential profits, etc., are intended only as general guidelines and have been obtained from sources deemed reliable; however, accuracy is not warranted or guaranteed by the Sellers or Swan Land Company. Prospective Buyers should verify all information to their sole and complete satisfaction.